Sit-stand devices used in the Take-a-Stand Project in Minneapolis, Minnesota, 2011. 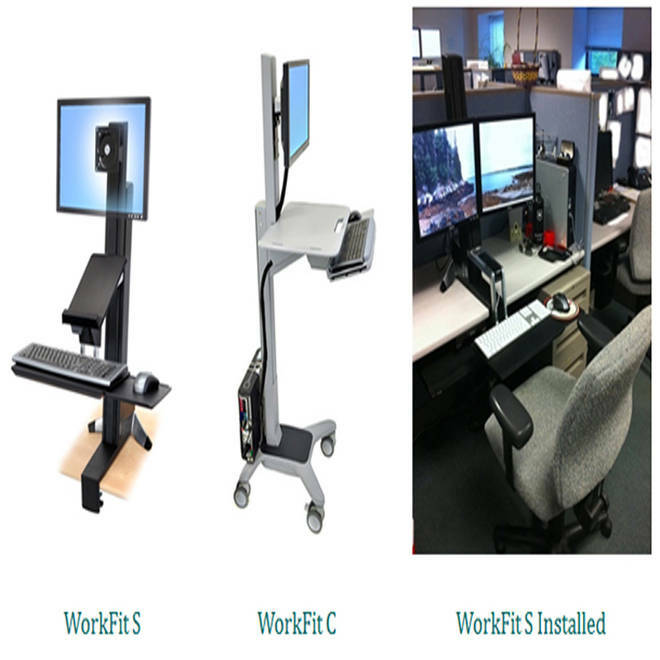 The Take-a-Stand Project was a partnership with a sit-stand device manufacturer, Ergotron, Inc, Eagan, Minnesota. Office workers who spent an hour or so a day at stand-up workstations felt more energized, productive and even happier, researchers reported on Thursday. And if they keep it up, they may help reduce the damage done by sitting at a desk all day. Study after study has shown that sitting all day long is bad for you. People risk developing lower back problems, kidney disease, heart disease and other ills – even if they exercise outside of work. “If you go out for a 30 minute run , and then sit for eight hours at work, you could still have health problems because you are sitting all day,” said Nicolaas Pronk, a vice president at Minnesota-based HealthPartners, a non-profit health care organization that provides clinics, health insurance and does health care research. Pronk decided to test special workstations on the organization’s employees. They recruited 34 volunteers to test some of the commercial workstations on the market that allow users to sit or stand, as they like, without having to move all their stuff. They tried models made by Ergotron, Inc. of Eagan, Minnesota. The question is, will people use them and if they do, do they stand up for enough of their days to make a difference. And if so, how does that affect them? Over seven weeks, 10 workers stayed at their usual desks, while 24 used the new workstations, Pronk and colleagues report in this week’s issue of the journal Preventing Chronic Disease. To be scientific, Pronk’s team checked in with workers several times a day to see whether they were standing or sitting and to see how they felt. “We provided all participants a prepaid cellular telephone and sent text messages at three random times throughout the course of the work day. Immediately upon receiving a text message, participants responded to the question, ‘Tell us what you are doing right now: sitting, standing, or walking?’ by using 0, 1, or 2 for sitting, standing, or walking, respectively,” the researchers wrote. They also surveyed the workers more thoroughly three times during the study, once at the end of the seven weeks. The workers who used the devices were lavish in their praise – 87 percent felt more comfortable, 87 percent felt energized, 75 percent felt healthier, 71 percent felt more focused, 66 percent felt more productive, 62 percent felt happier, and 33 percent felt less stressed. “Not a single person in the intervention group indicated that they did not like the device,” Pronk said. In fact, HealthPartners now offers them to all employees. “Around 30 percent have them. There are about 2,000 people today who have one at their station,” Pronk said. People sat, on average just over an hour less every day. While standing didn’t help lower back pain, it reduced upper back and neck pain by 54 percent, Pronk found. Research is piling in that that shows just the act of sitting most of the day can cut years off your life. Researchers reported in July that cutting the time that people spend sitting to less than three hours would increase the U.S. life expectancy by two years. And reducing the time spent watching TV to less than 2 hours daily would increase life expectancy by 1.4 years. Last month, British researchers found that people who spent the least amount of time sitting were also the least likely to have chronic kidney disease. Pronk is himself sold on the idea. “I don’t think this is a fad. It’s a new way of doing your work,” he said. He uses one now. “I probably stand about 80 percent of the time when I am in my office. I leave it up when I leave at night so it’s up when I come in in the morning,” Pronk said. Part of the appeal may be that employees can control the device themselves. “You literally can push this device up with your hand and you can stand up,” he said.